George Matland outside the warehouse Signs of Victory is turning into a shelter for people in need. The Signs of Victory mission has received final approval of a five-year, $100,000 loan at 2.9 annual percent interest to help build a new Albany homeless shelter, but because of a state rule on wages the city contract is also driving up the project’s cost. The city council, acting as the governing agency of the Central Albany Revitalization Area, unanimously approved the loan agreement on Wednesday. 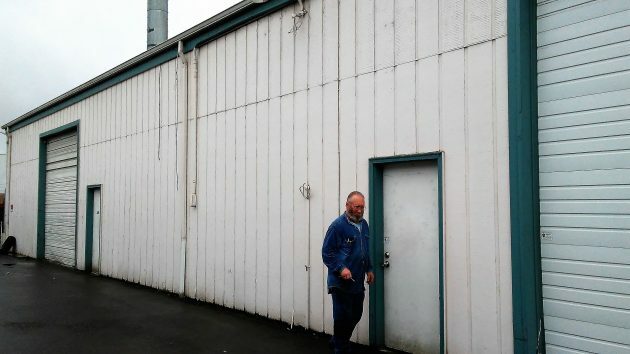 Signs of Victory intends to use the money to help pay for converting the two halves of a former warehouse at 405 11th Ave. S.E. into two dormitories for 114 people. One side will house men, the other women and children. The property is part of a complex at the corner of 11th and Jackson Street that also holds the Signs of Victory offices, food distribution, warming shelter and church. As part of the agreement, Signs of Victory agrees to close the “Freedom Roadhouse” shelter it has operated for years at 120 Seventh Ave. S.E. The CARA advisory board had endorsed the loan application as part of its mission to deal with blighted conditions downtown. Originally, last year, CARA had intended to buy the Seventh Avenue Roadhouse so that George Matland, the director of Signs of Victory, and his sister could use the proceeds for the new shelter. But the city backed off buying the house. And the loan deal was made instead. To get the first $50,000, the mission has to give the city a deed to the Seventh Avenue house, close the house and secure it. The city will return the deed without recording it once the new shelter is complete. No one explained, and the council didn’t ask, how a boarded-up old house advances the CARA mission of urban renewal. George Matland in his office Thursday. The mission won’t get the second half of the loan until the new shelter is completed and approved for occupancy. 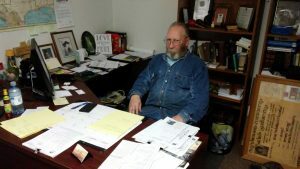 In his office on Thursday, Matland told me that he had received a bid for sprinklers at more than $57,000. But with the wage requirement, the sprinkler bid went up 11 percent to about $64,250. If his revised bid for plumbing rises by about the same rate, he expects it to jump from $27,500 to $30,525. He still seems confident he can complete the project this summer. If a city councilor hires a craftsman to work on her home, would she say “I know you bid the job for $57,000 but I’m going to give you $64,250.” Of course not. Not a single person on the face of the earth would pay more if the money came out of their own pocket. But it’s another story when taxpayer money is used. Such is the kookiness of government. Government should stop meddling in the free market. All it does is put people out of work whose labor isn’t worth the legislated rate and drive up taxes for the rest of us. The unions are happy as clams to go along with this socialistic philosophy, so they become close allies in the process. Competition is capable of setting a fair and equitable rate for labor, and the consumers are capable of judging its adequacy in terms of both cost and quality. This state law has been around for many year and has cost taxpayers millions of dollars. Albany voters should contemplate the implications for the proposed school construction bond. It means that if your bond is for $100 million, you could have built the same structures for $65 to $75 million. This number is derived from a first-hand estimate by the school superintendent in Lebanon at the time our district passed a $50 million bond for school improvements. It is not the fault of the school district managers, it is state law. As long as we keep electing “Progressive” (Democrat) legislators it will not change. Once upon a time there was a Republican Party that believed in fiscal responsibility, free enterprise, and the free market. If I lived here at the time I could have voted for Packwood, McCall, and Hatfield. Then they added the social issues and stupid drug policy. Later they added denigration of science. Finally they added isolationism, mega-voodoo economics, and alternate reality. All to appeal to certain groups of voters to construct a very strange coalition. Now I’m left with no viable voting choice except the Democrats, even though I agree with all three comments currently visible above.